In Australian comedy you have the comedians who have their own show on network TV or the ABC, you have comedians who are guests on network or ABC comedy shows, you have comedians with their own festival show, and then there are the club and open mic comedians. Obviously, not everyone makes it from open mic to a festival show and so forth all the way along the chain. This is not just a matter of talent. Life circumstances, money, willingness to put in the work, and luck all play a part. And some can make a happy profession staying at certain links such as gigging and touring. Dilruk Jayasinha and Adam Francis are at an early stage of their career, but clearly have enough experience and insight to put together a sharp show. RomCom feels professional. The comedians are well presented. The stage is neatly arranged. The props are well thought out. The comedians have a good rapport and their material tightly intersects. RomCom is like a wind-up toy that once set in motion goes through a delightful dance. 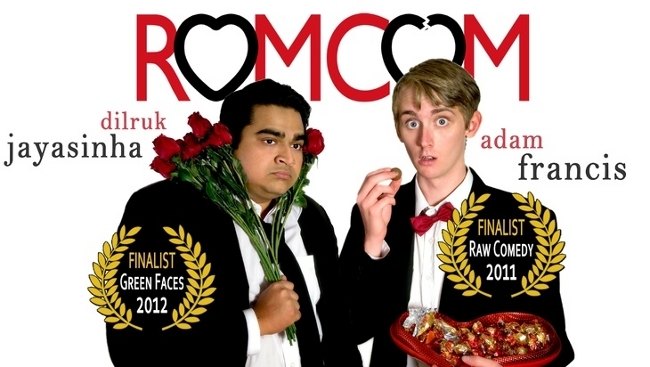 RomCom is about the journeys we take when we find ourselves in a relationship. I’m having to be very careful how I describe this, because Jayasinha and Francis have cooked up a few delicious twists and surprises in their show. Dilruk Jayasinha speaks about his very modern initmate interactions with women and the sort of relationships that arise. He has an amiable persona that easily won the audience over. His strong point was his storytelling: whether it was about growing up in Sri Lanka or his connection with Emma. What I say now has to do with Jayasinha’s preview show and may be worked through by the time you see him perform. He needs to slow down so people can better hear him, he also needs to take the time to look into people’s faces and smile. These are common problems for all comedians with first night jitters. I would also say if he is aiming for TV someday, he should further develop his already considerable skill in being personable. Like the audience more, make the show more about them, take that scary step and do some improvisational riffing with them. You’re good, this will make you great. Adam Francis explores my favourite style of comedy: absurdism. This is an interesting niche because it may take some time for your audience to find you, but once they do, they are loyal. So, I would like to encourage him to keep at it, you will find your rewards. Francis plays the mischievous innocent with wit and creativity. His childlike art was done with more effective skill than people may realise. I was deeply impressed with his ability to develop moving moments. He is clearly drawing his inspiration from comedians such as Demetri Martin and Michael Workman. I look forward to see him further develop his own persona. He is already a considerable charmer. RomCom is a good night out. Take your boyfriend or girlfriend to see it.